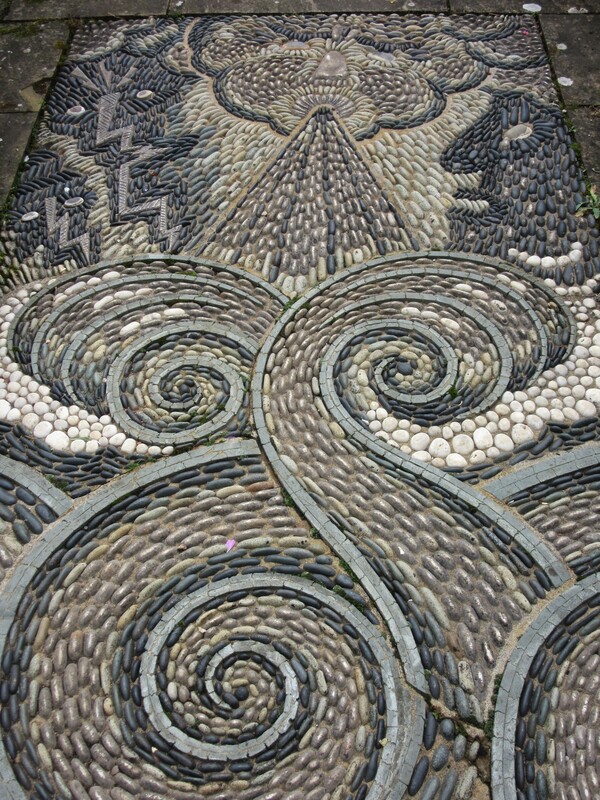 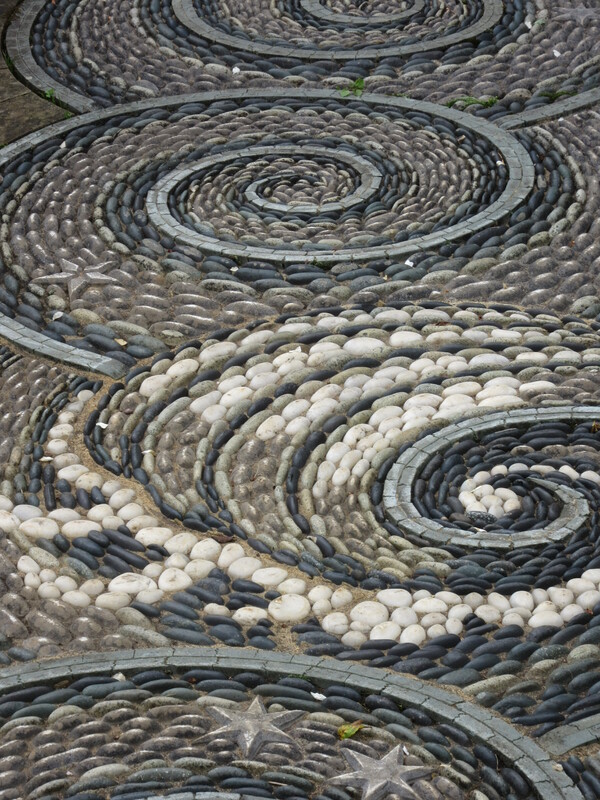 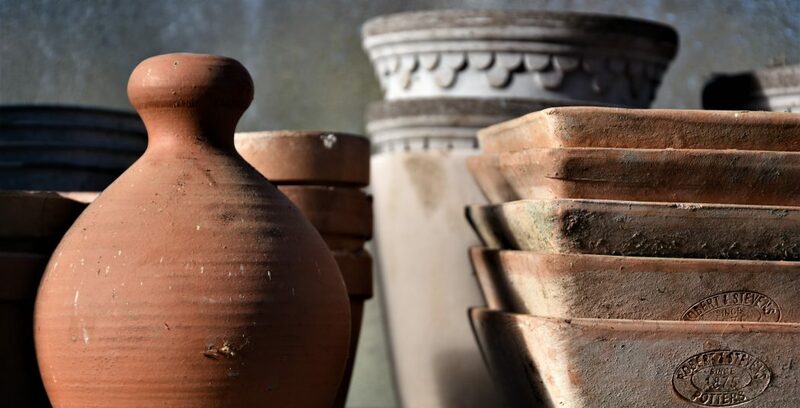 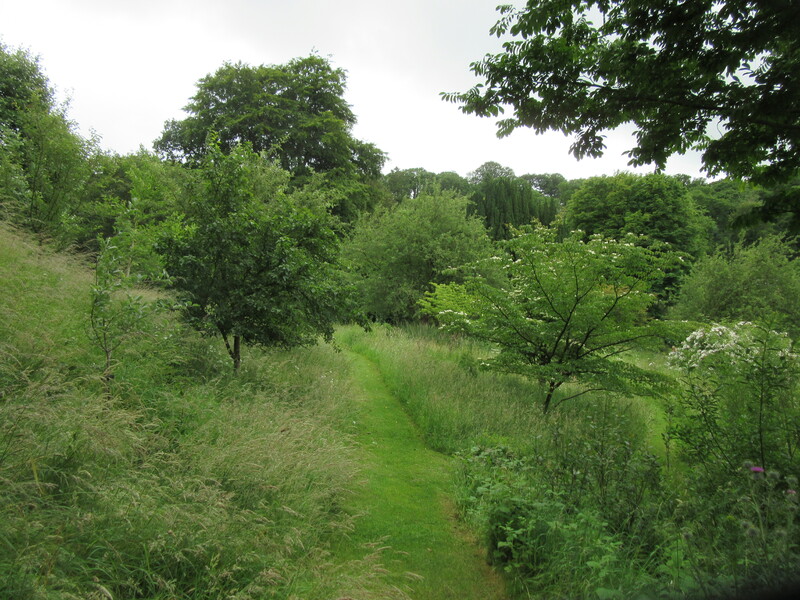 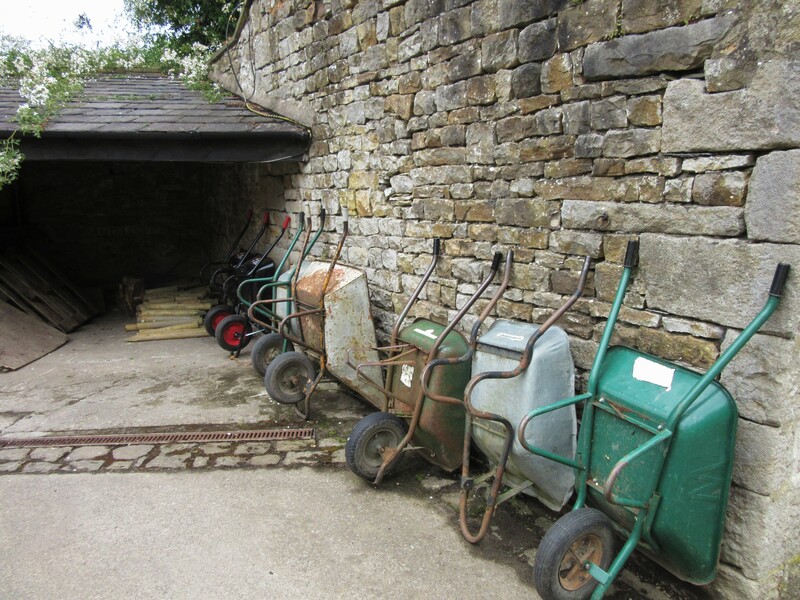 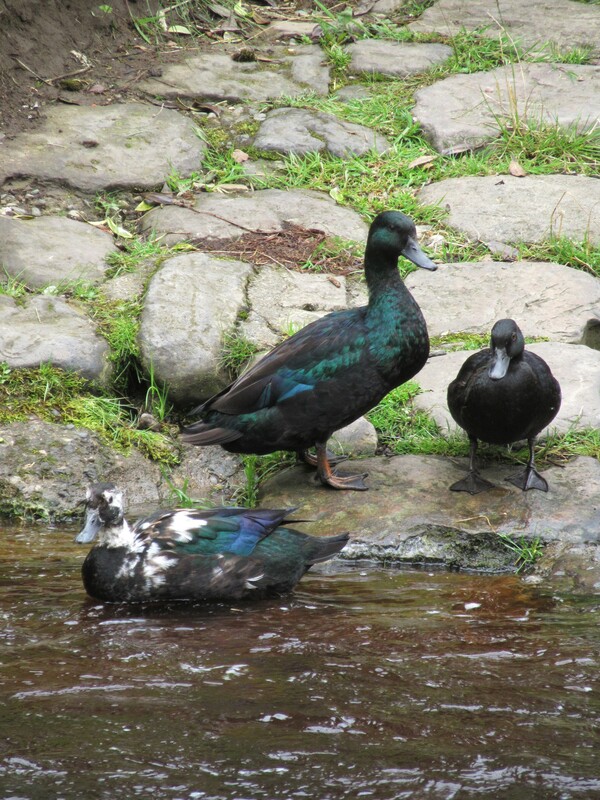 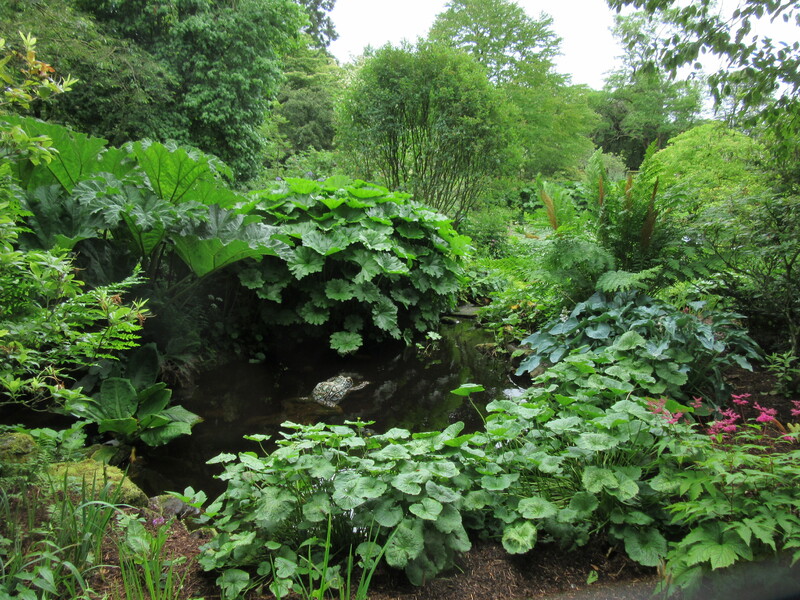 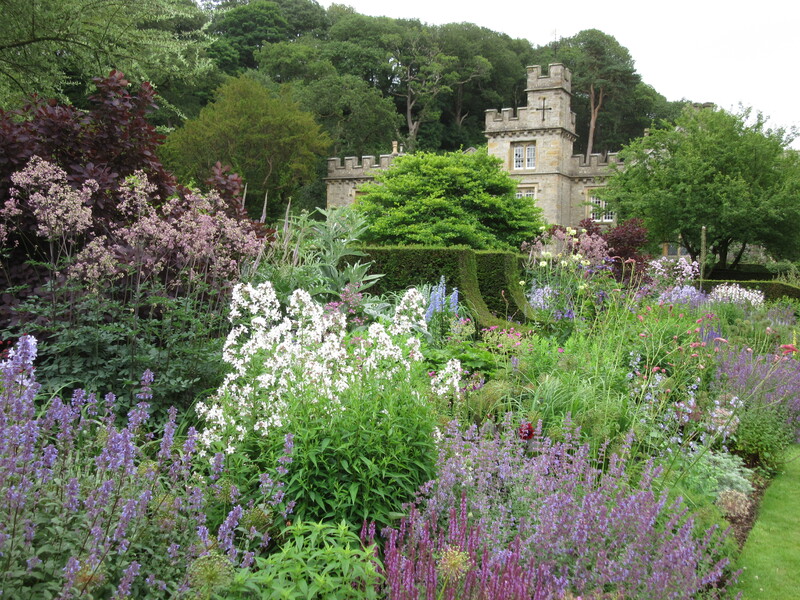 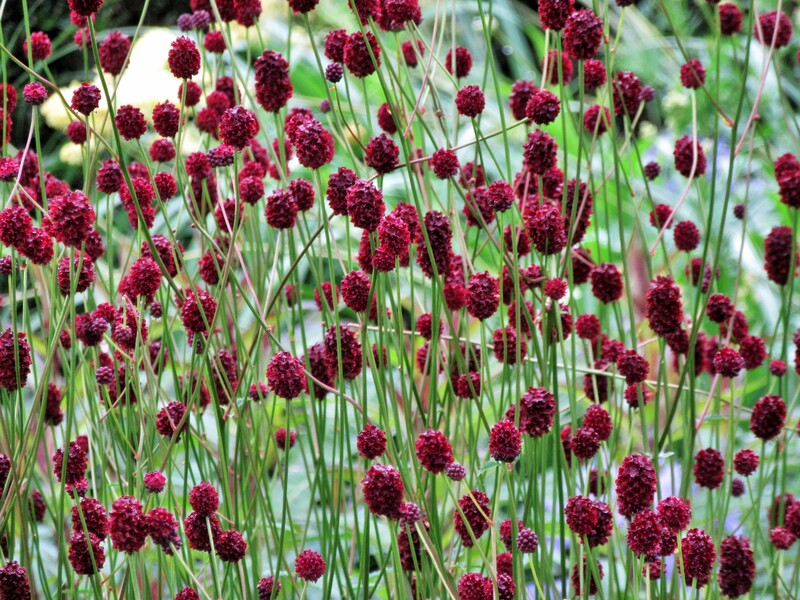 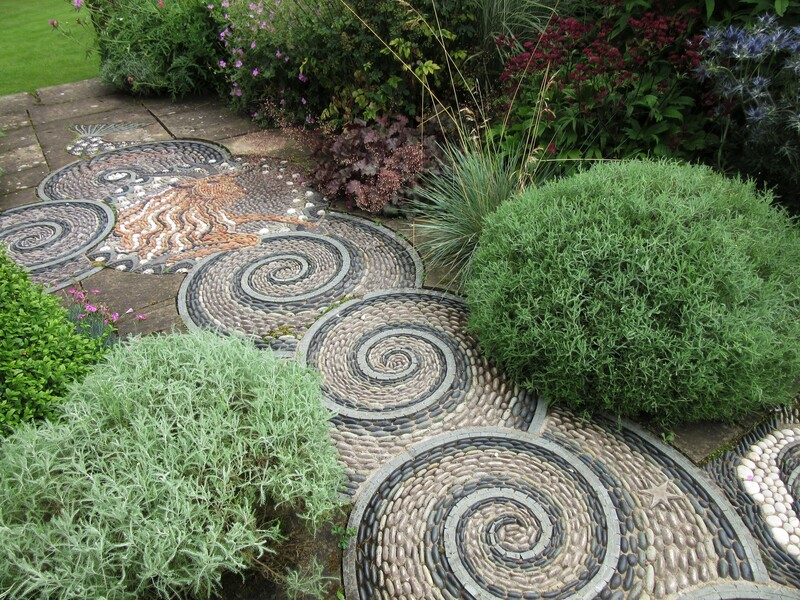 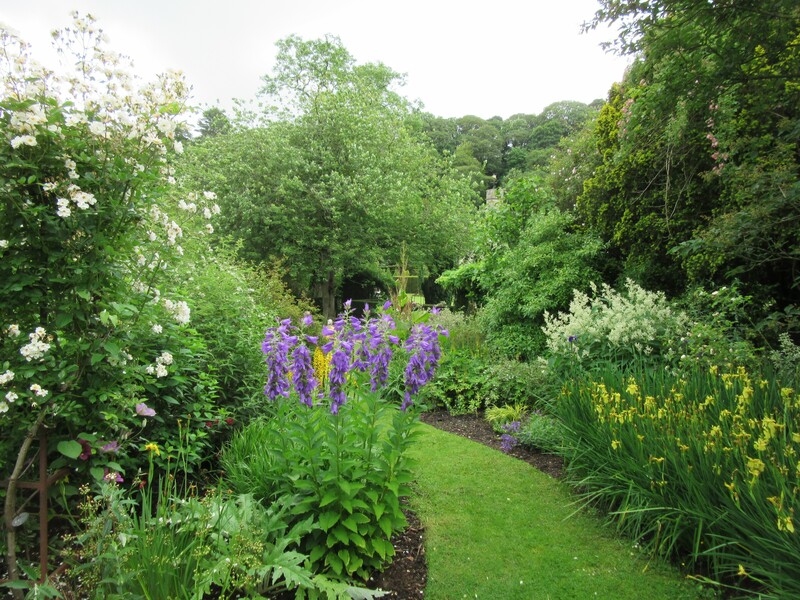 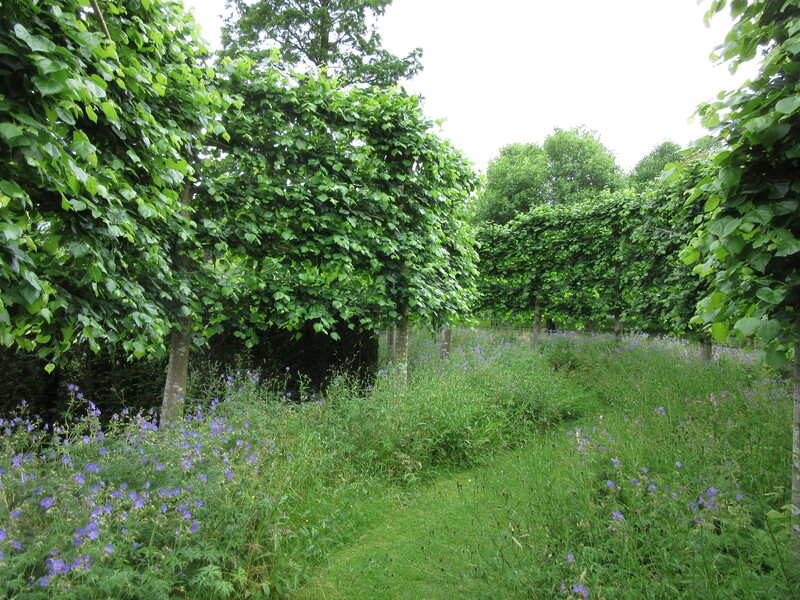 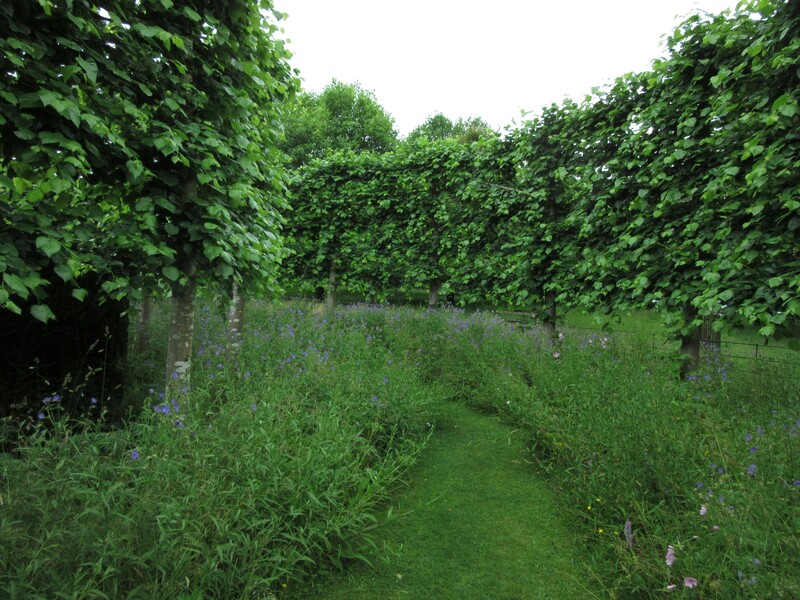 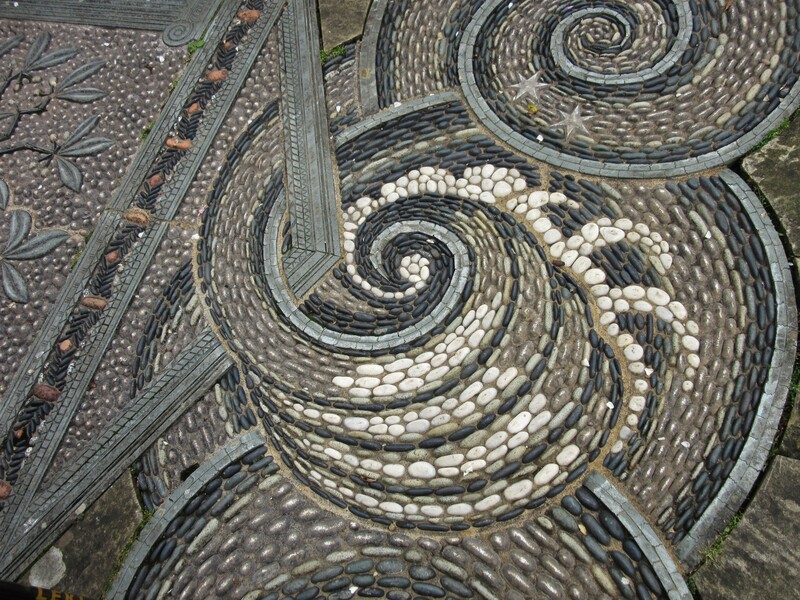 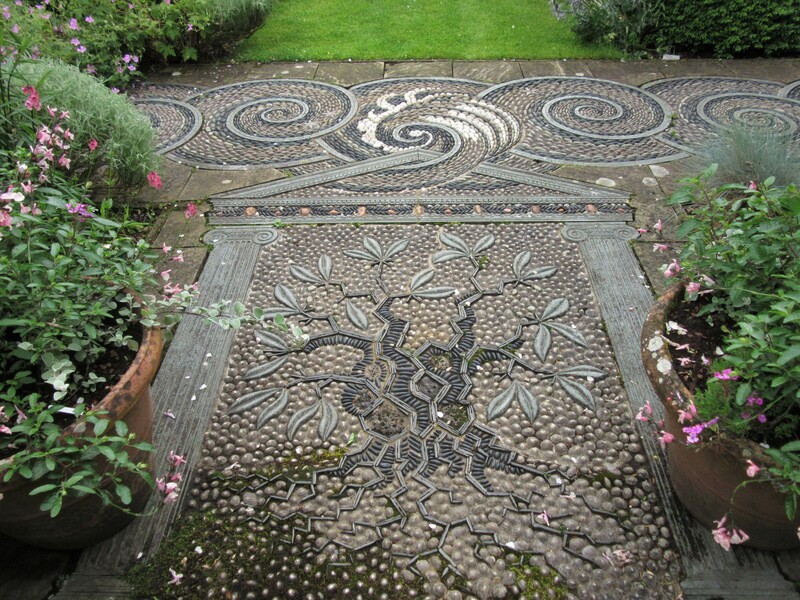 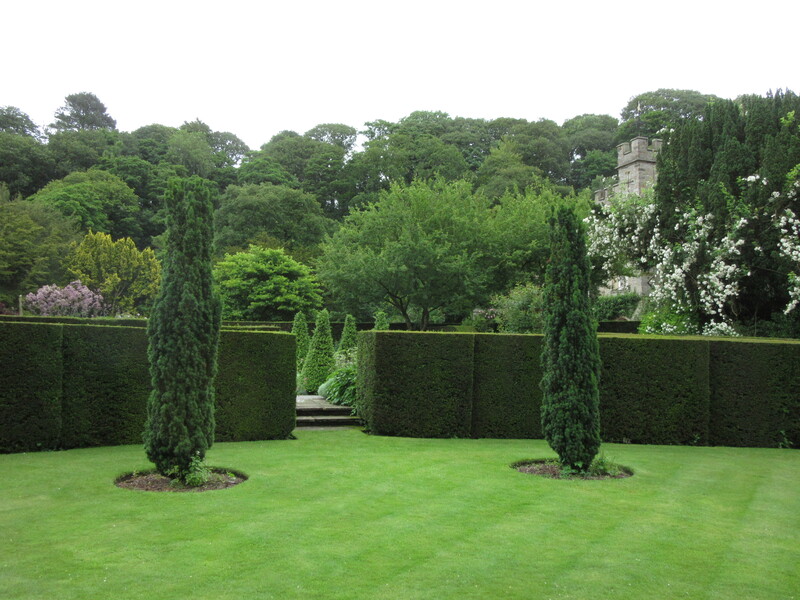 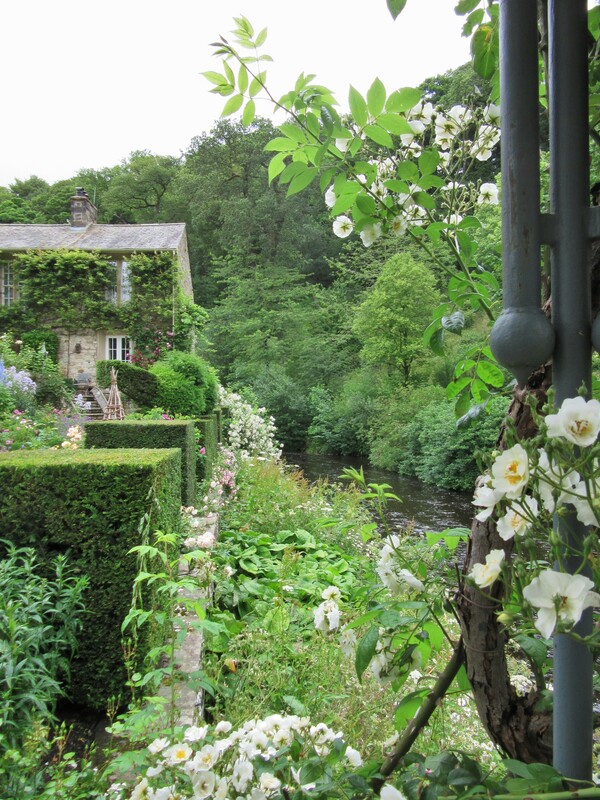 A chance remark and the right alignment of dates and here we are, wandering through these remarkable gardens created in the midst of a wooded valley, bisected by a tributary of the River Lune, a showcase for the imagination and talent of garden designer Arabella Lennox Boyd. 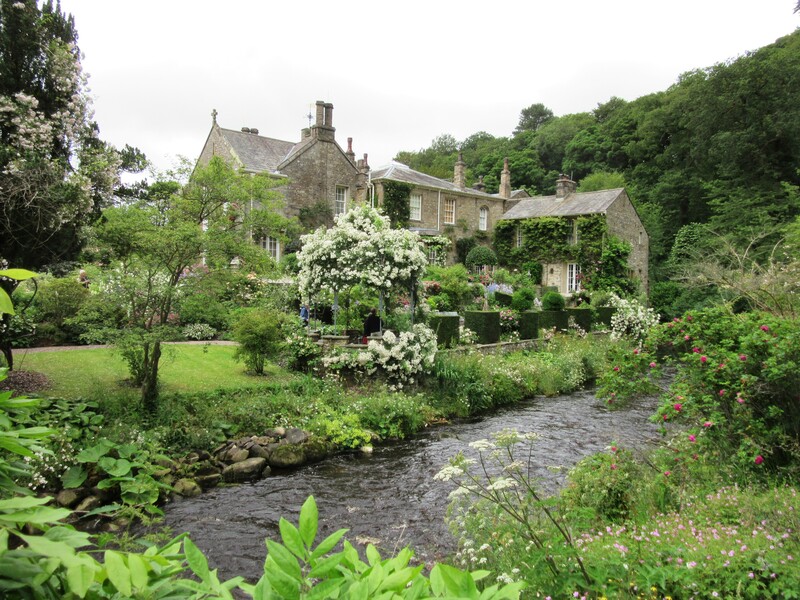 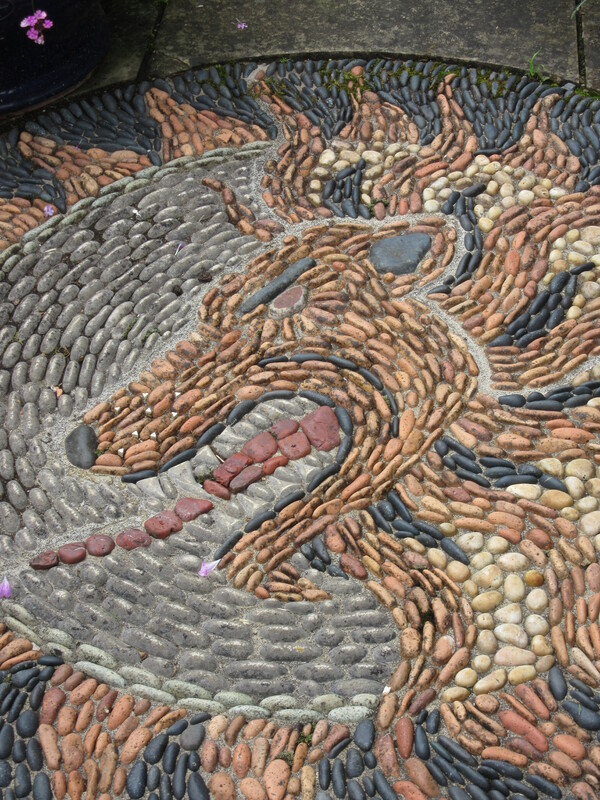 Up North, in the village of Caton outside of Lancaster and a short hop to the coast at Morecambe, a beautiful garden has been carved out of the woodland, a series of garden rooms, borders, lawns and terraces around a Gothic inspired fairytale house and black-reflecting lake, everywhere the sound of rushing water and enclosed in the wilder tree-studded slopes all about. 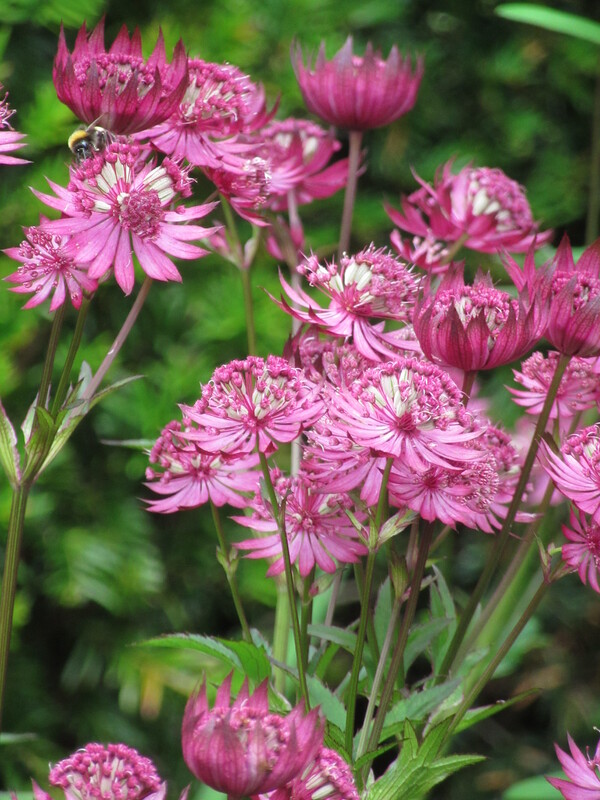 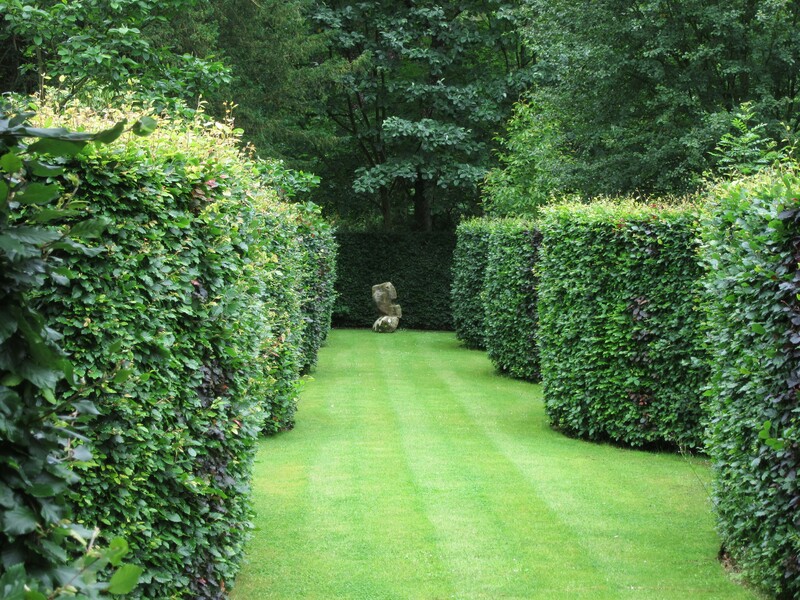 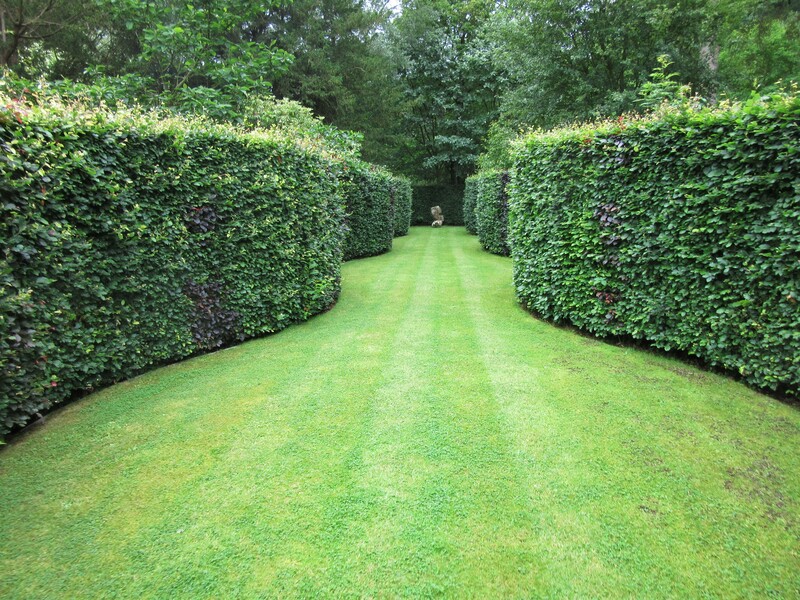 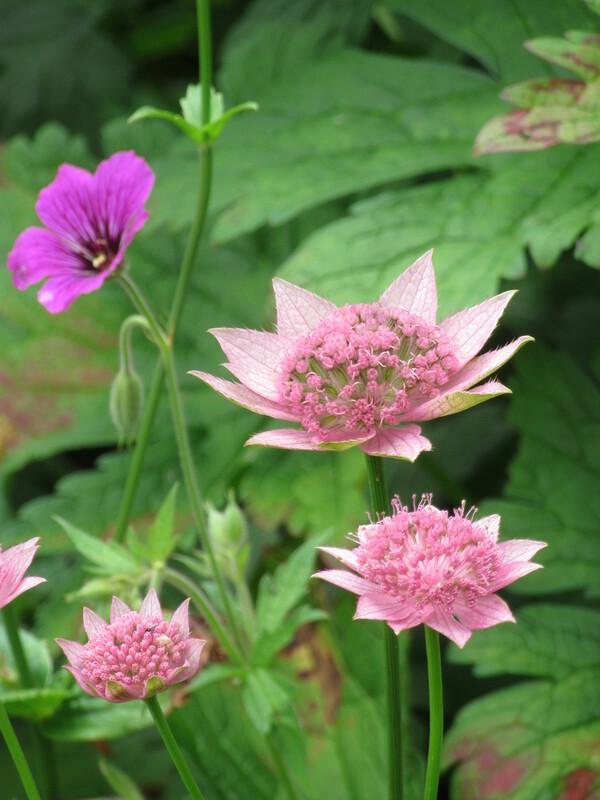 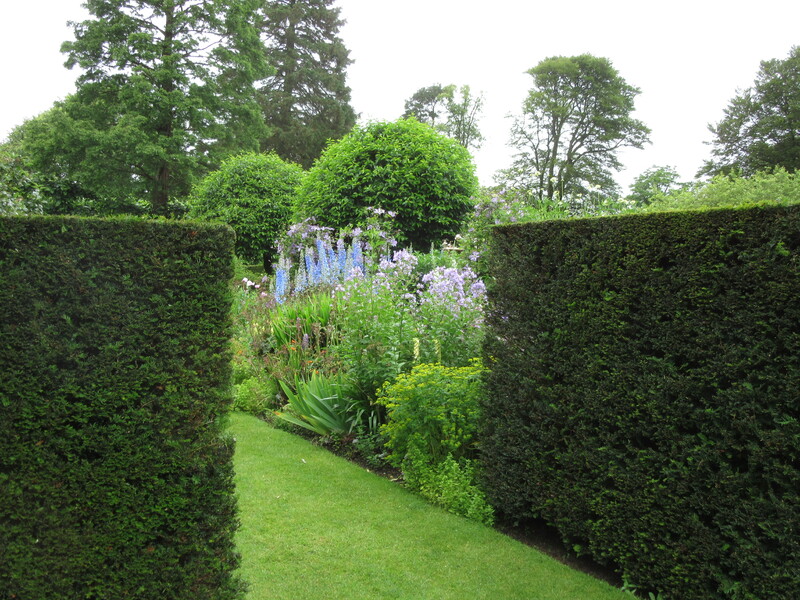 The garden expands into the wilderness, with rhododendron walks and winding paths leading you back to the tamed, but wilder planting of the garden boundaries and back into manicured lawns, sharp-cut topiary yew, pleached trees and herbaceous borders. 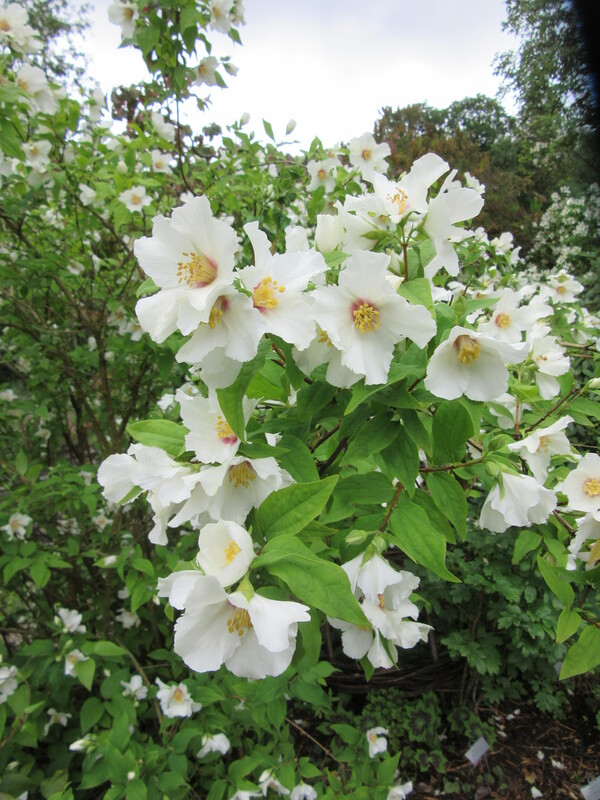 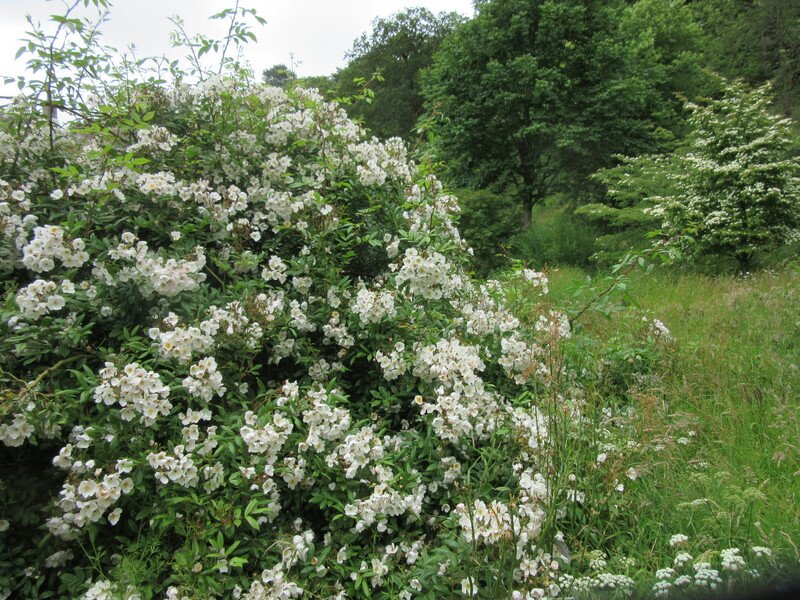 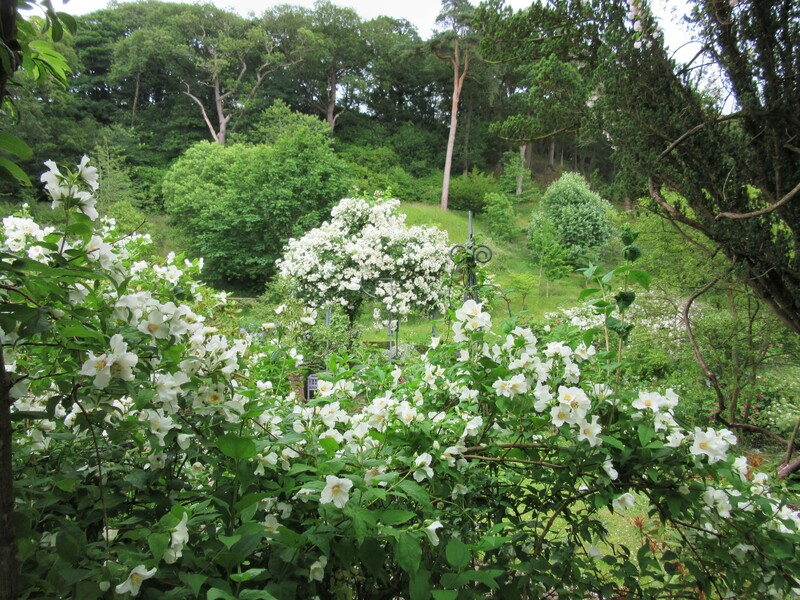 Everywhere the scent of roses and philadelphus. 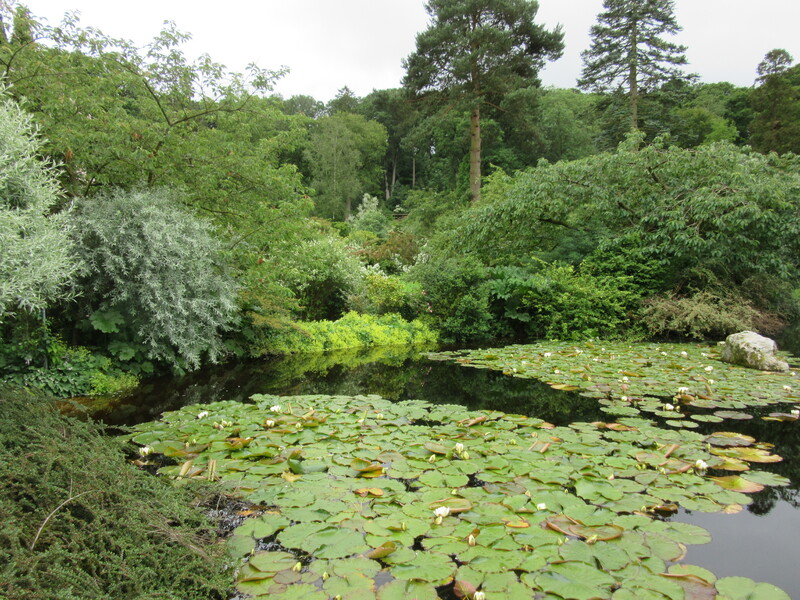 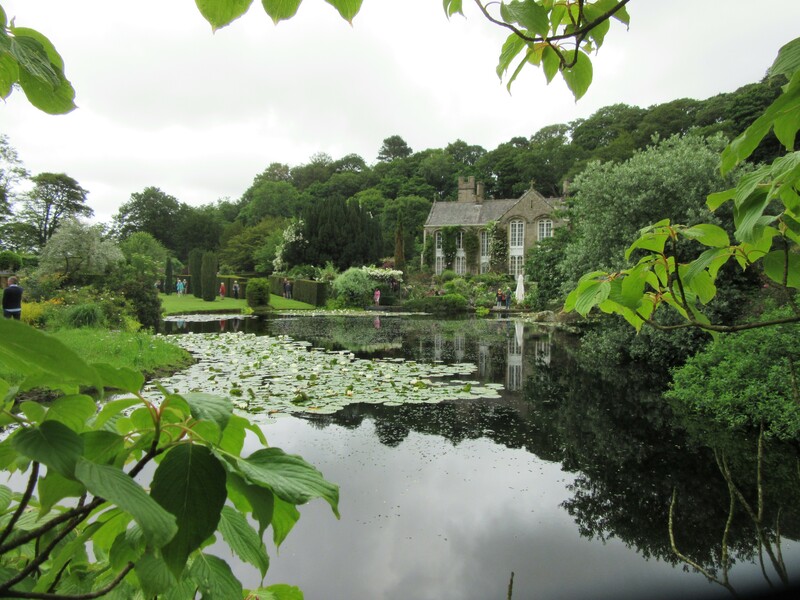 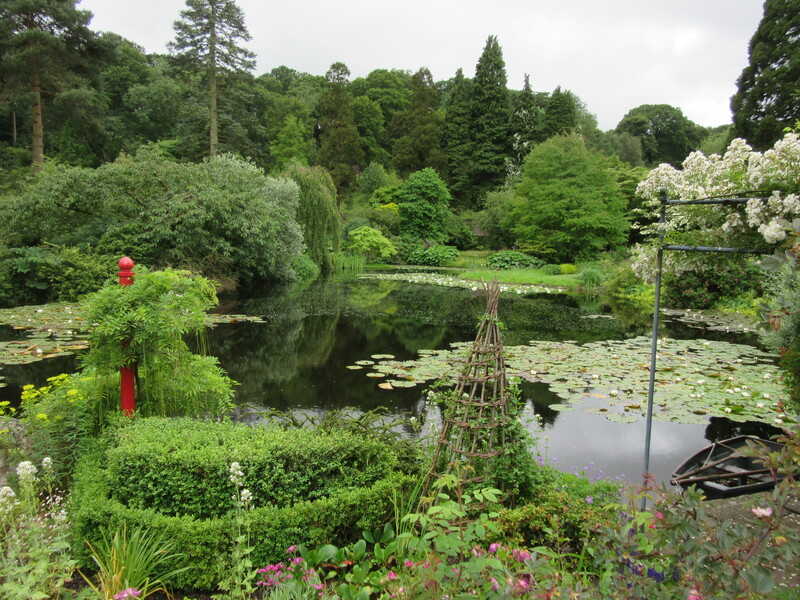 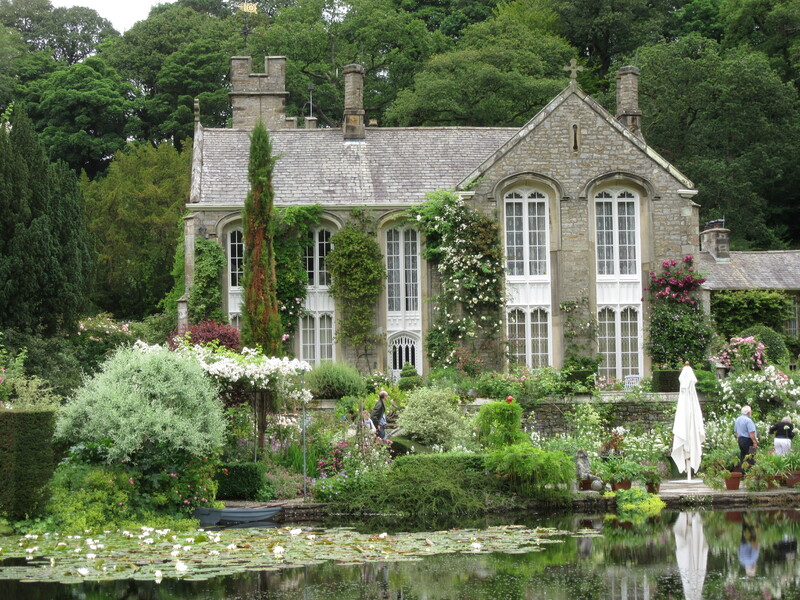 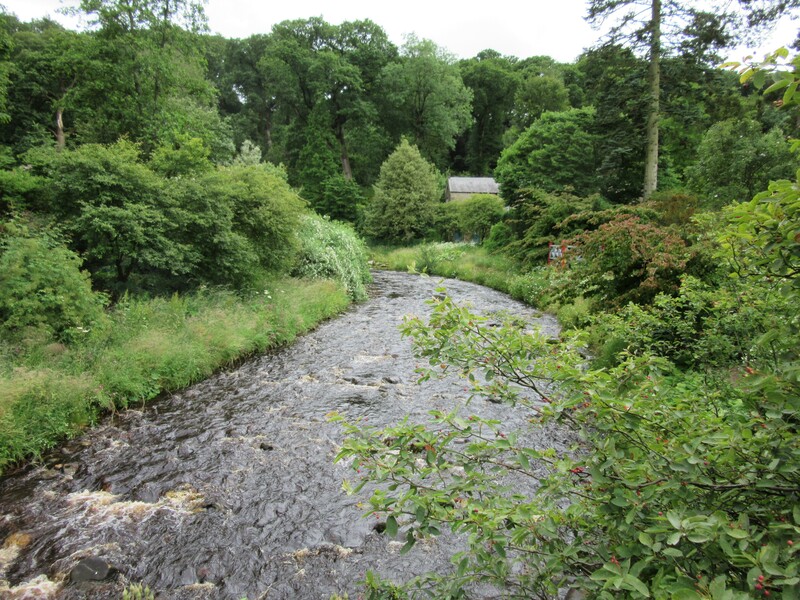 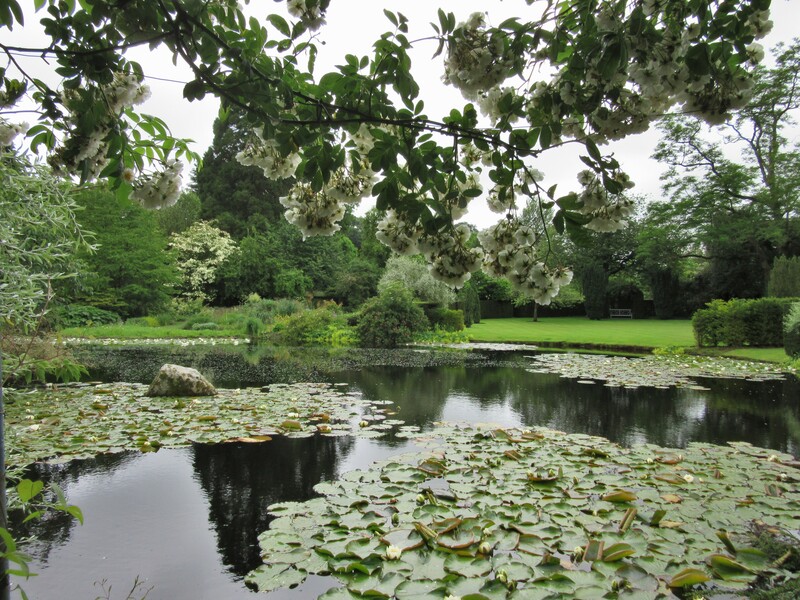 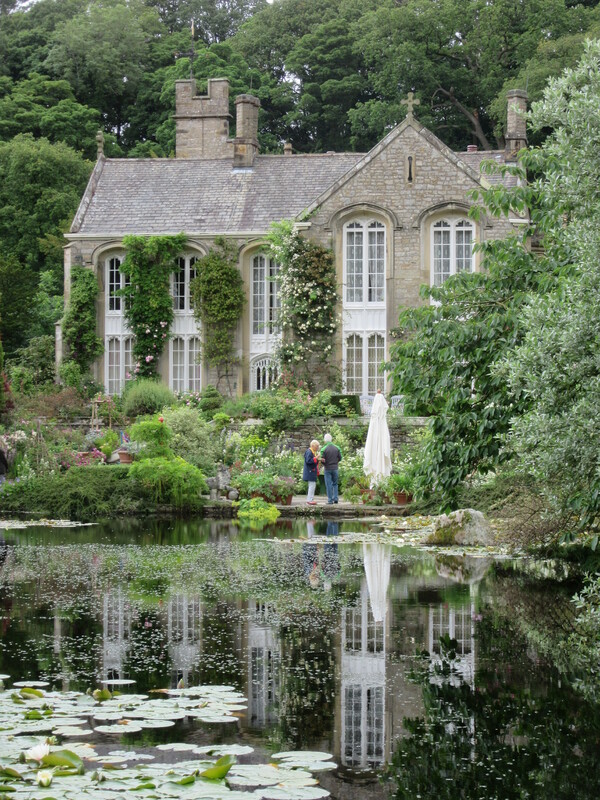 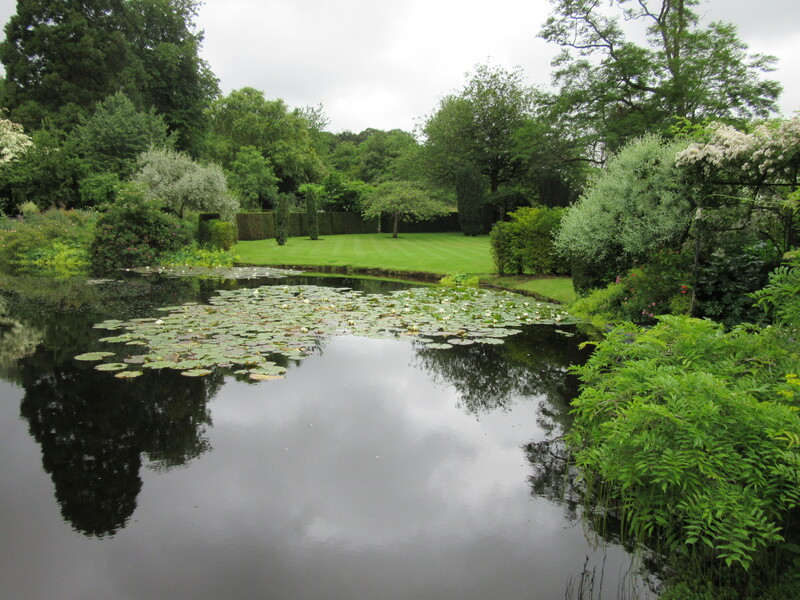 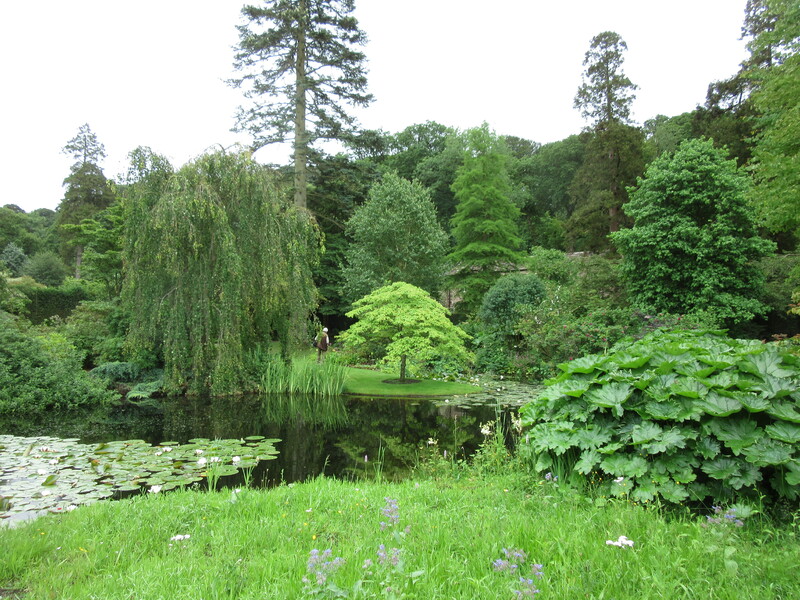 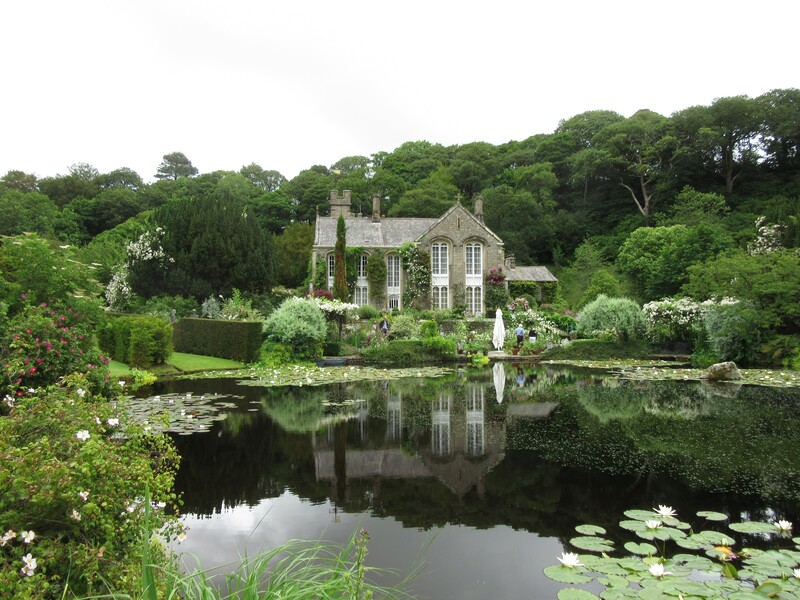 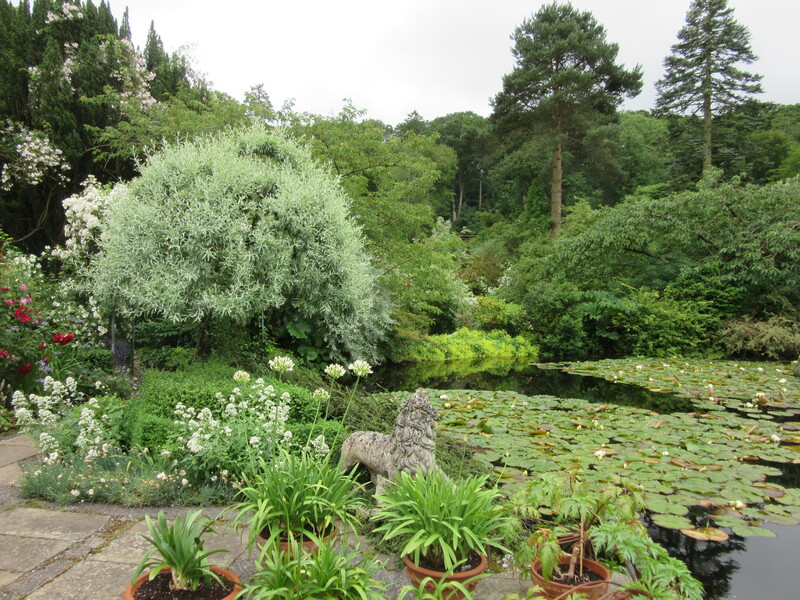 The lake was banana-shaped when the Lennox Boyd’s came to Gresgarth Hall and it was widened to give the impression of a river opening out in front of the house. 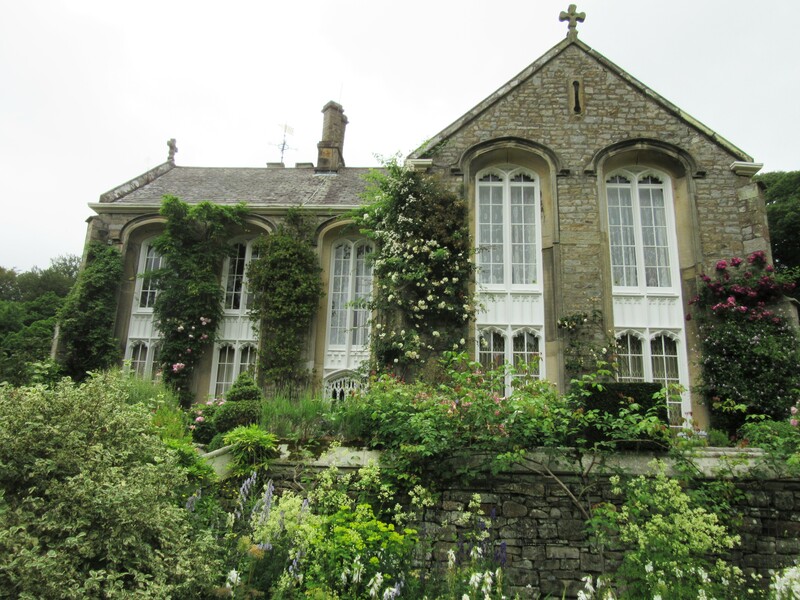 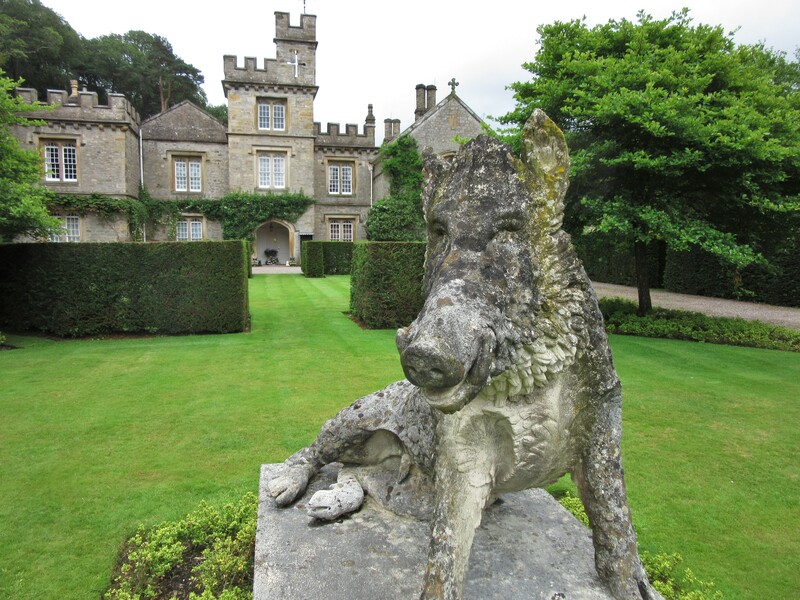 There has been a dwelling here since 1330; the current building was remodelled in the early 1800s in the fashionable Gothic style. 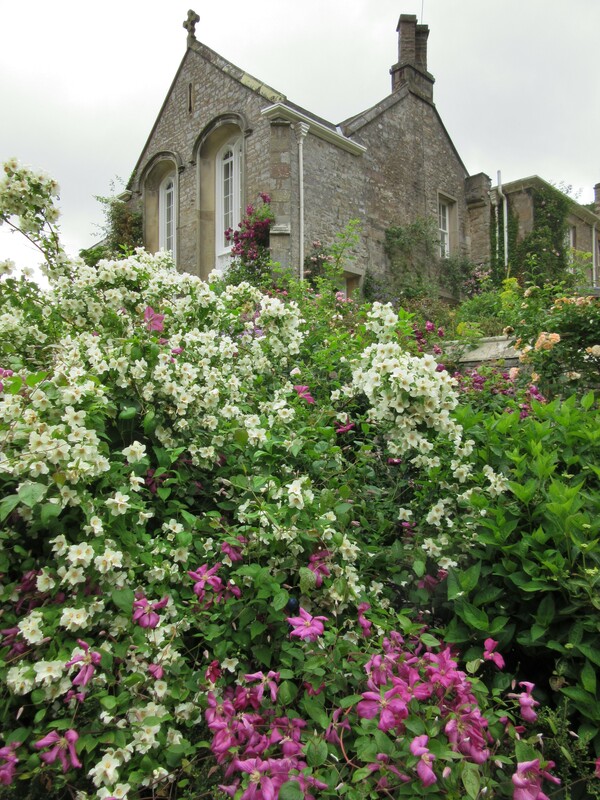 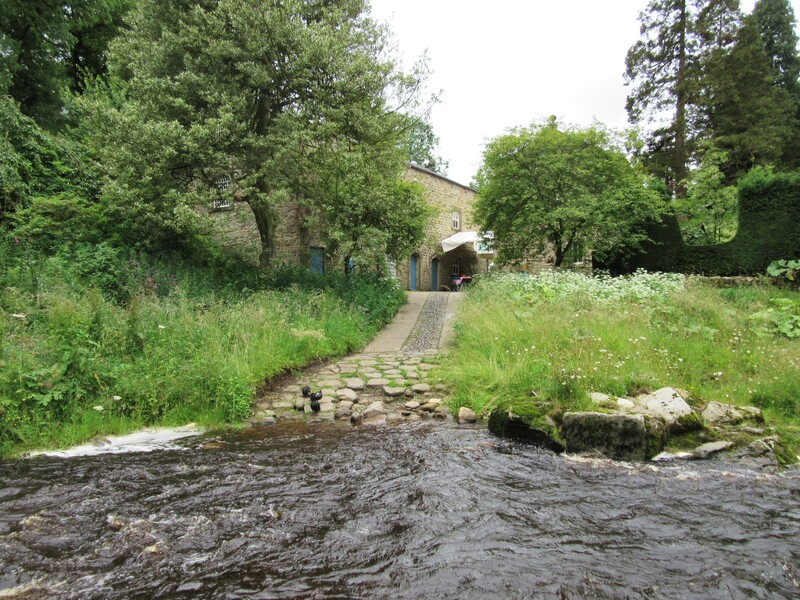 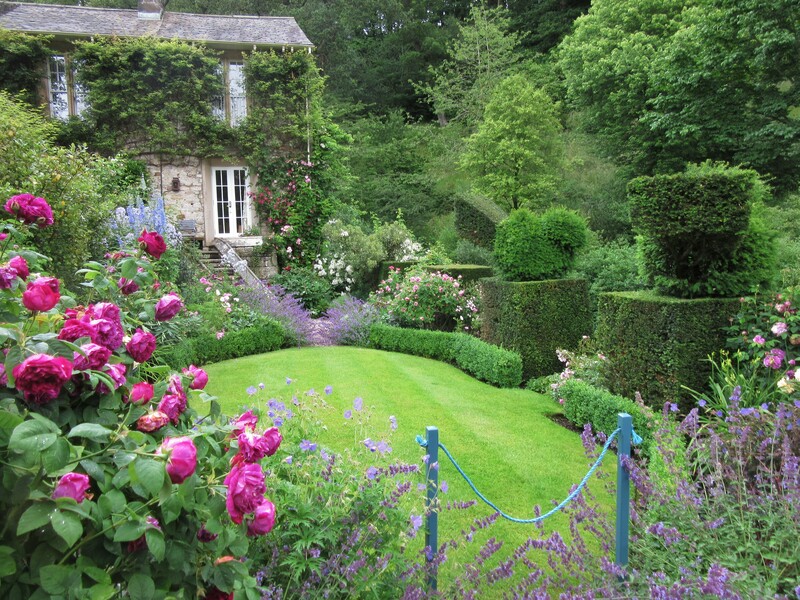 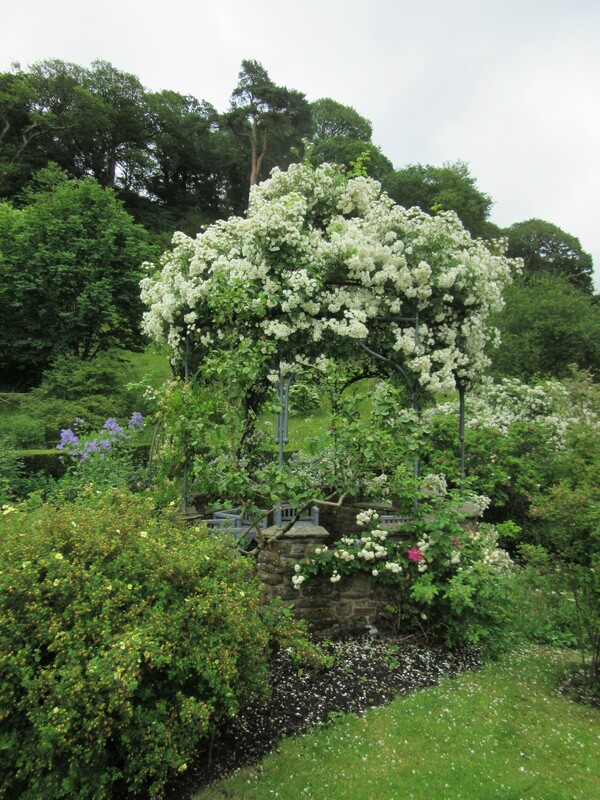 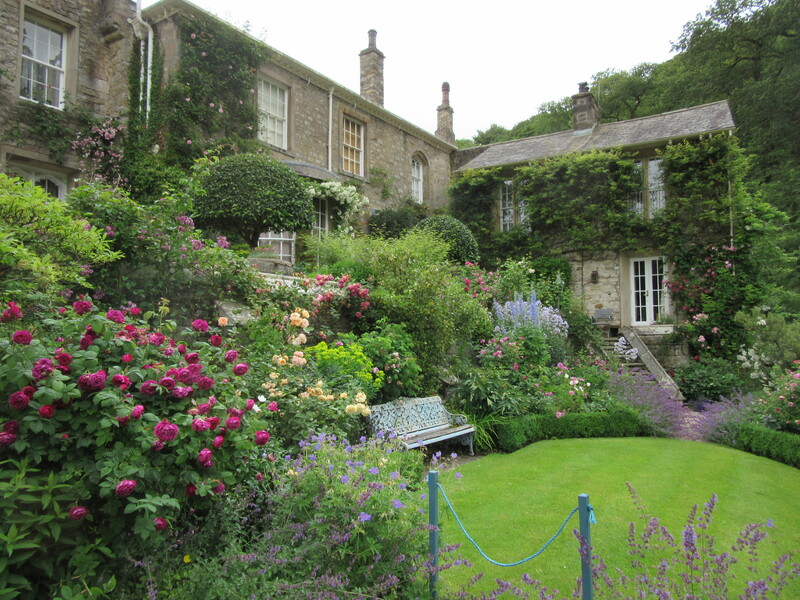 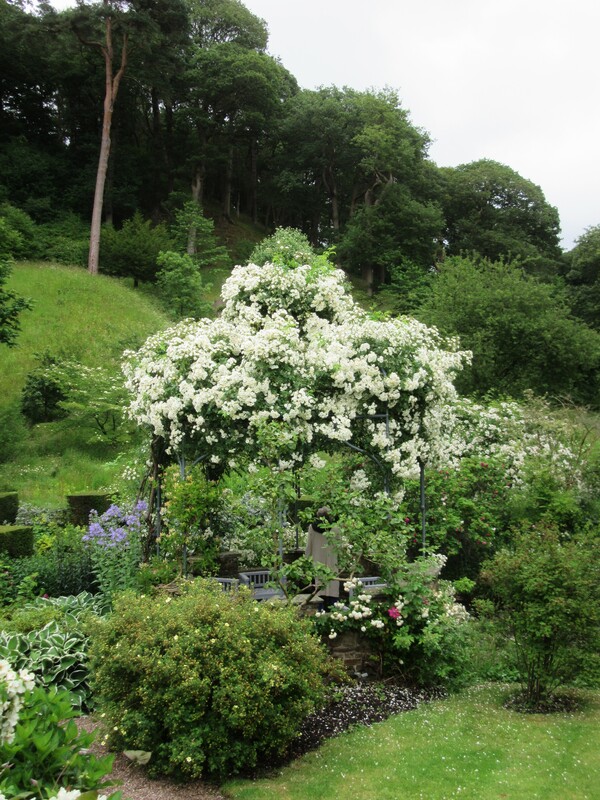 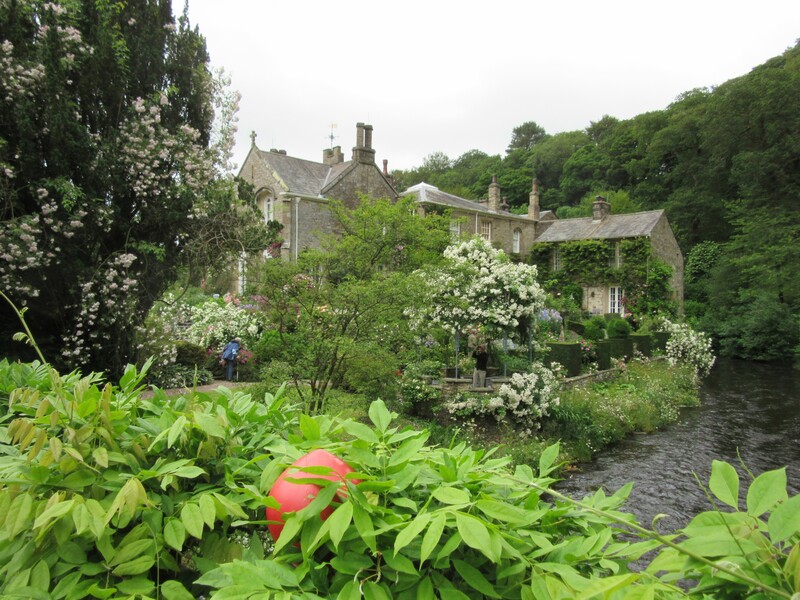 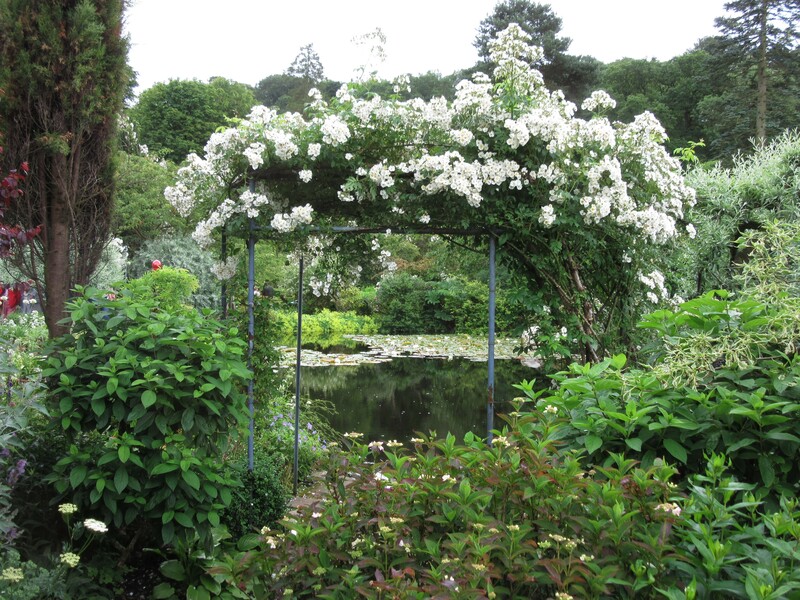 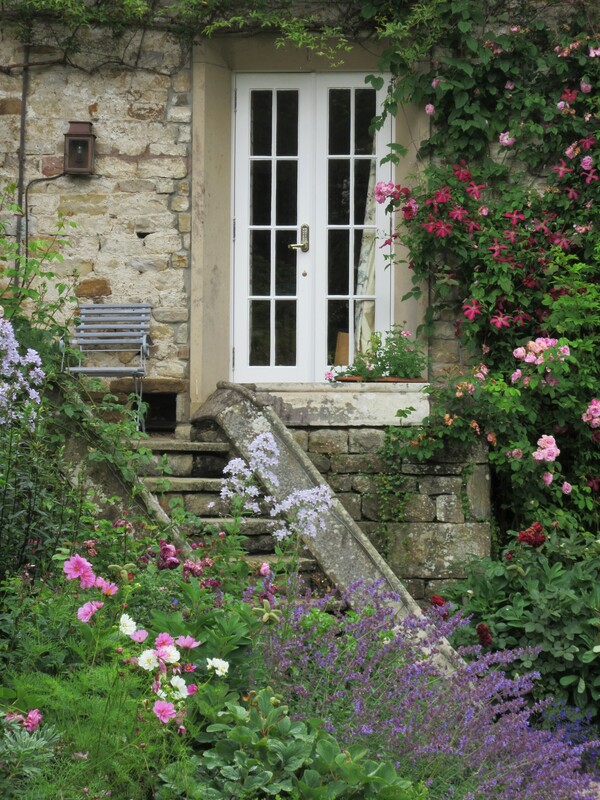 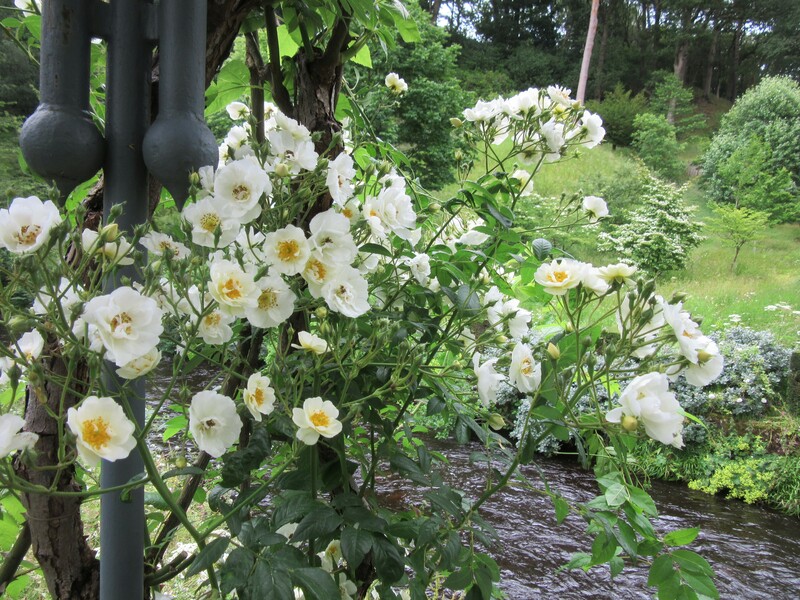 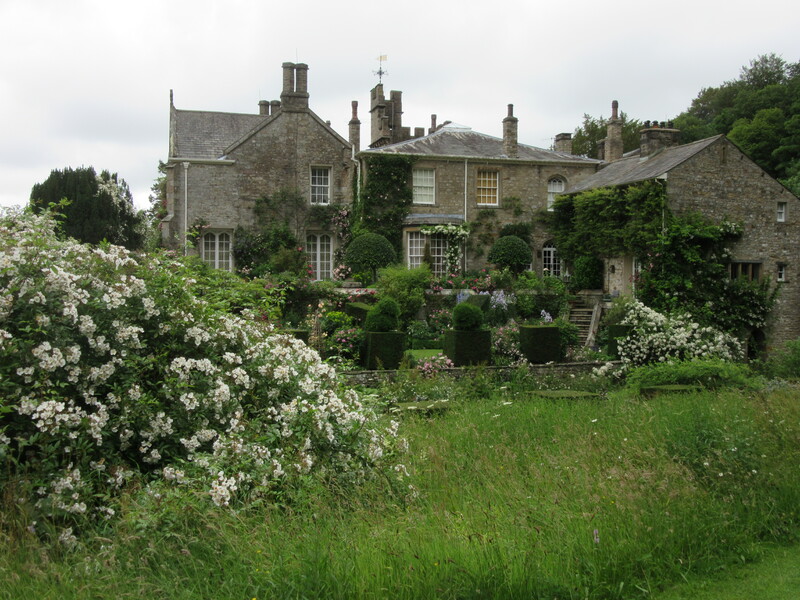 Rambling roses are used to great effect all through the gardens – trained on this side of the river, a tributary of the River Lune, but clambering into trees on the opposite bank and forming great fragrant free-form shrubs. 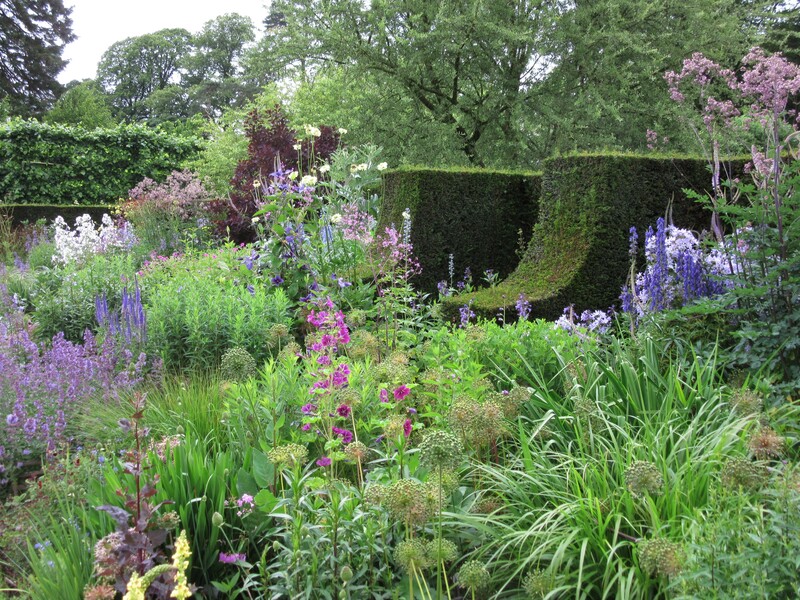 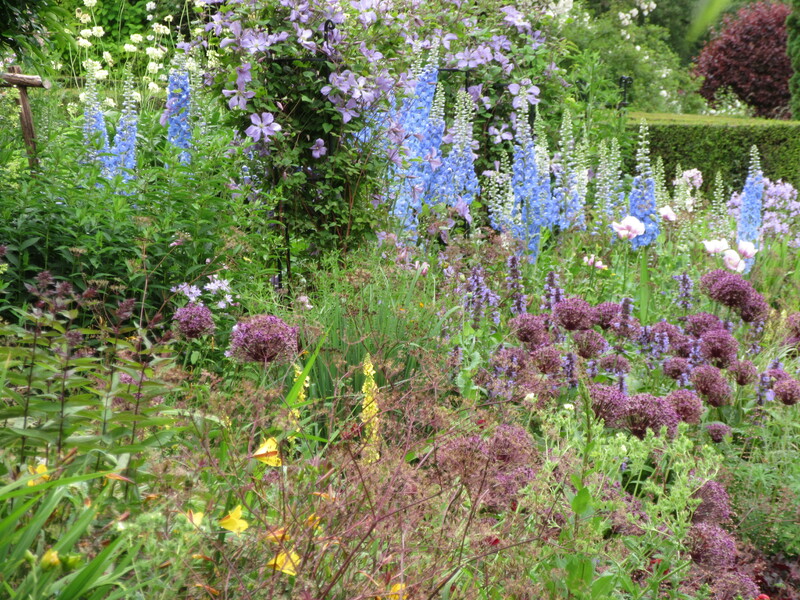 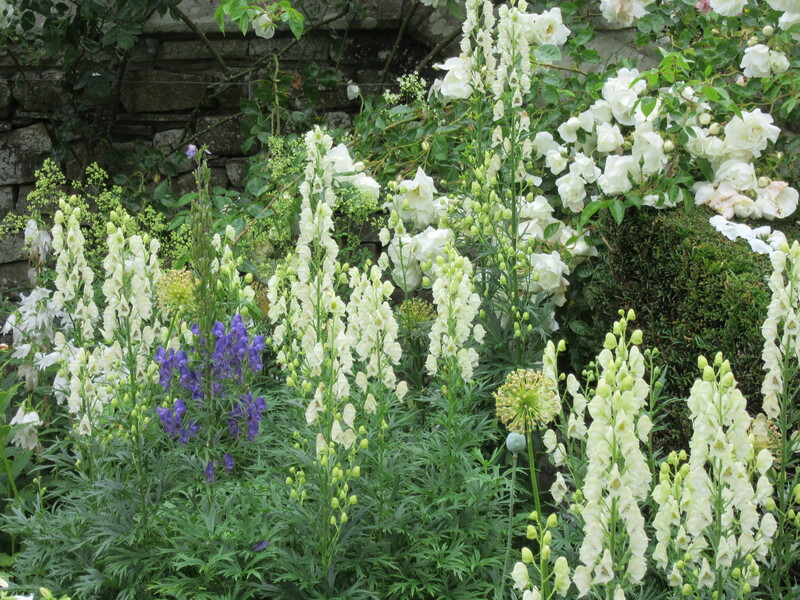 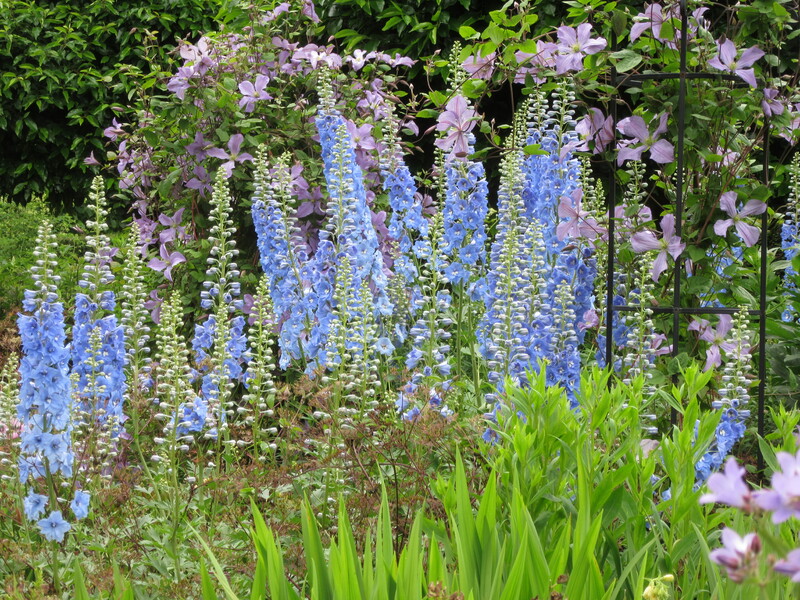 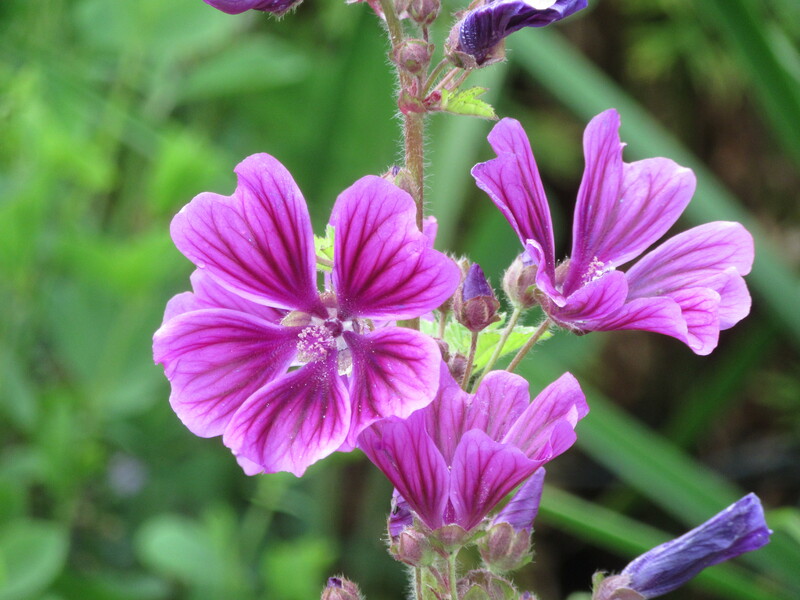 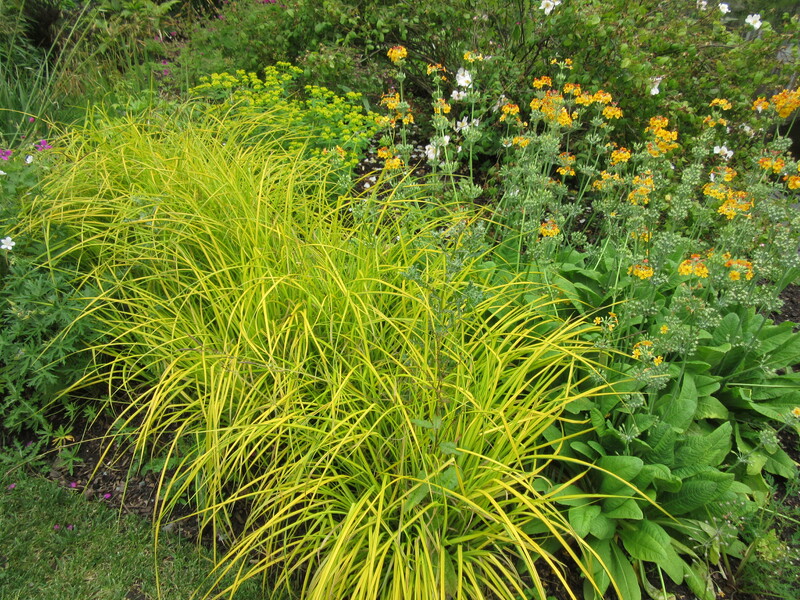 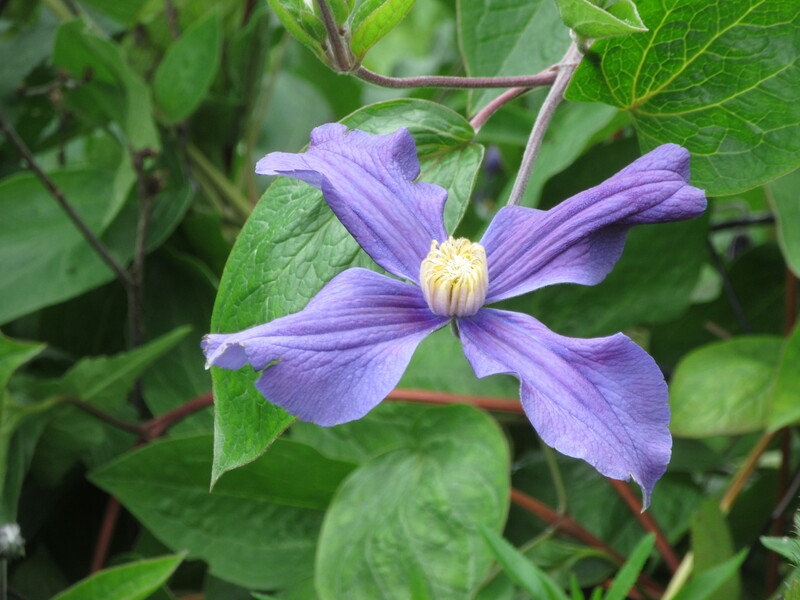 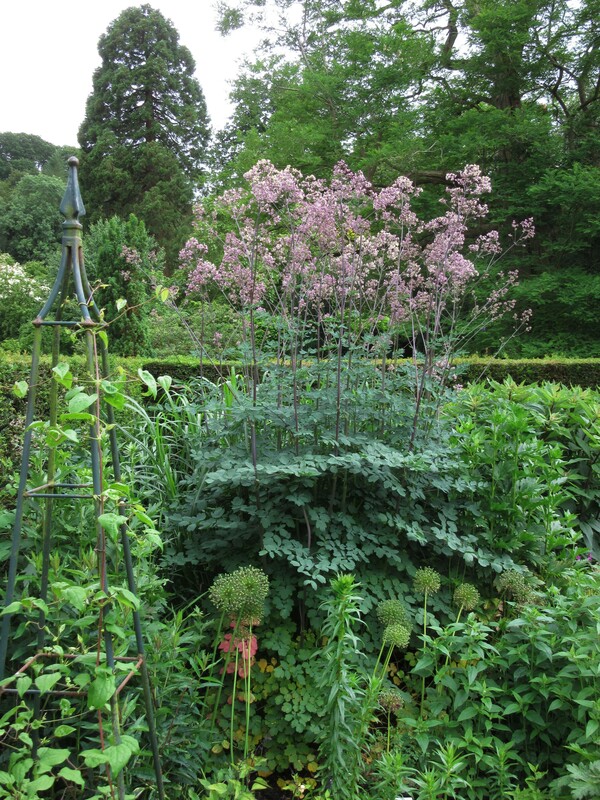 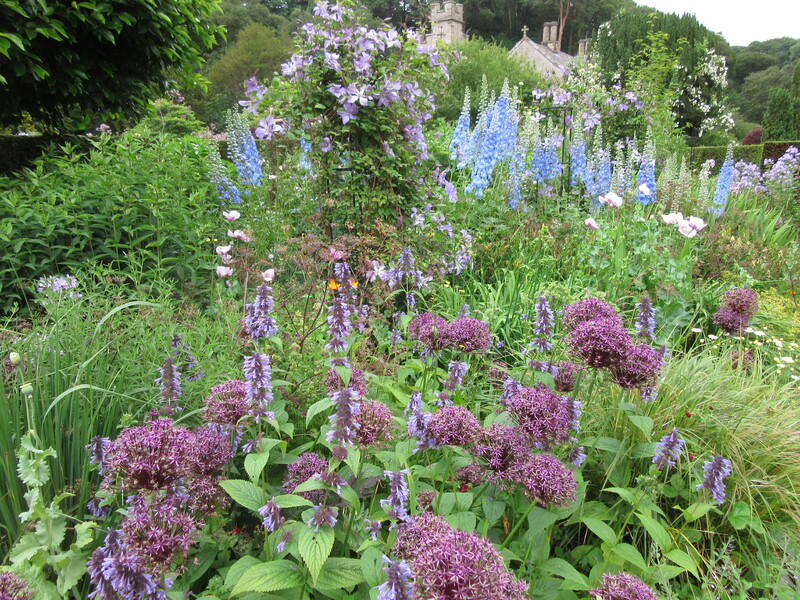 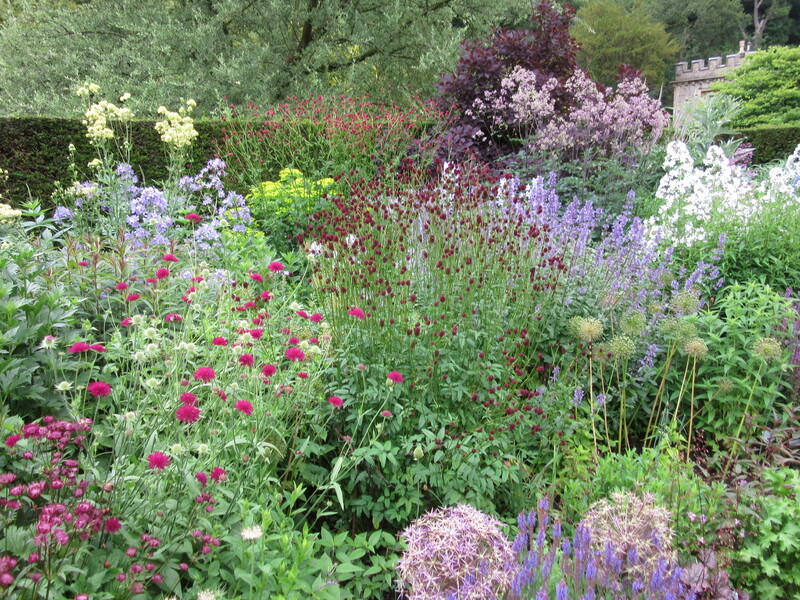 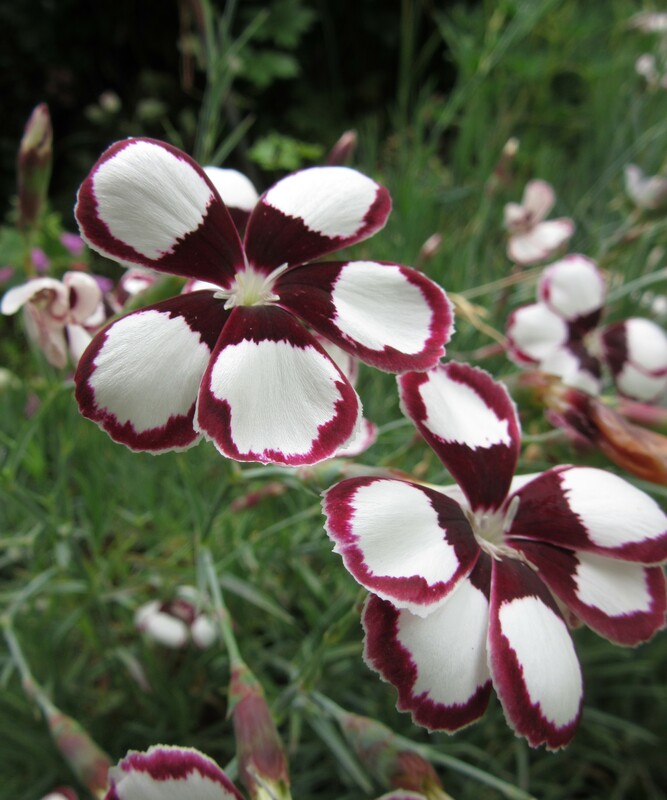 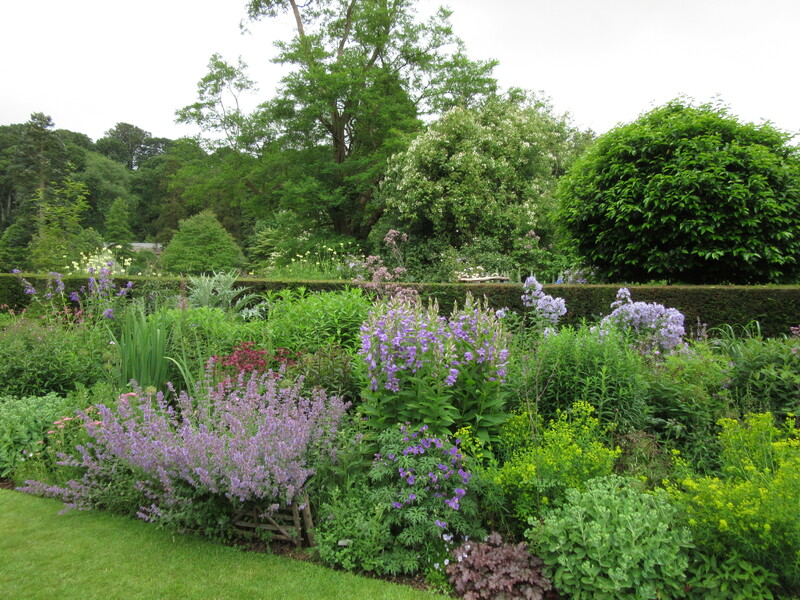 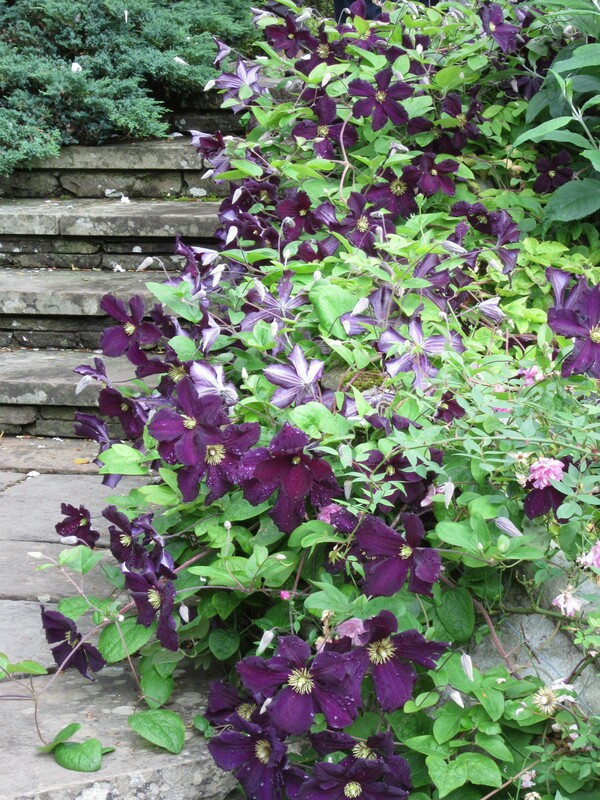 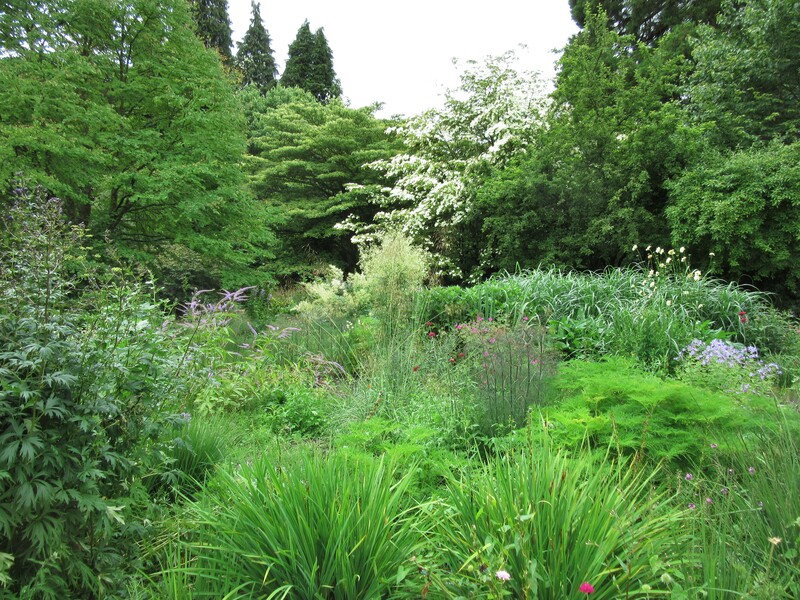 The effect is still to mirror the planting, one side to the other. 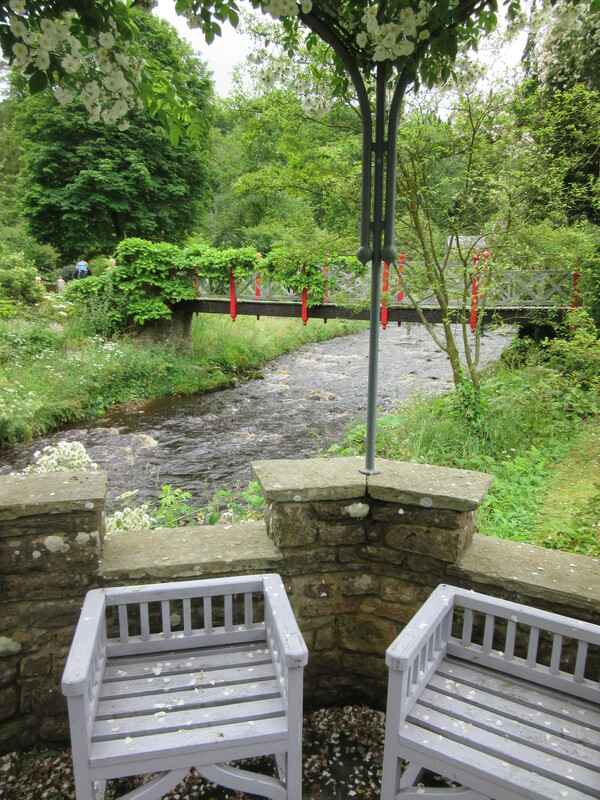 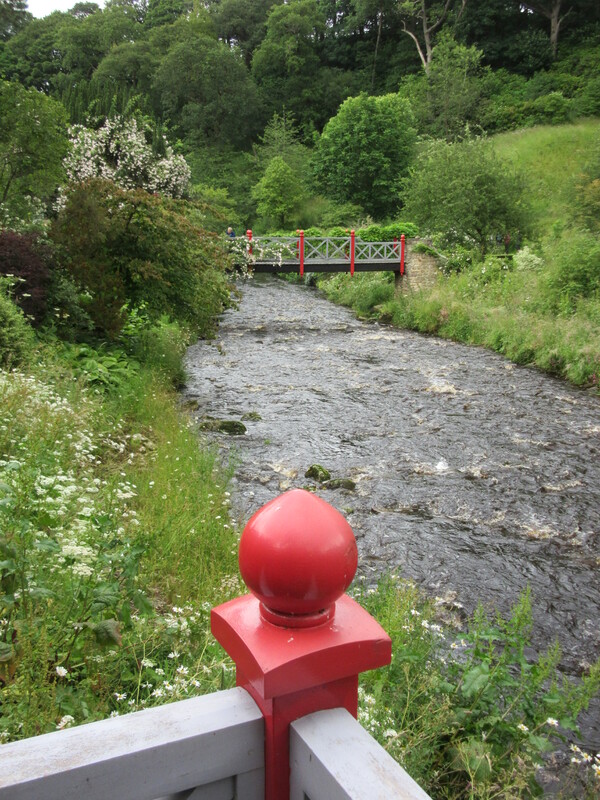 A Chinese influence with the red posts combines with Arts and Crafts – the shallow steps for example. 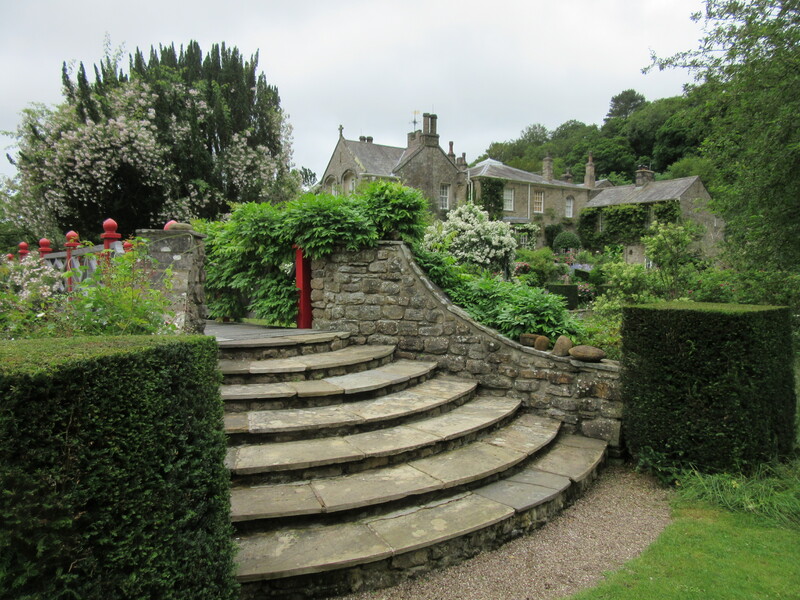 We return to the house for a closer look – this lawn and series of terraces overlooks the hillside opposite, across the river. 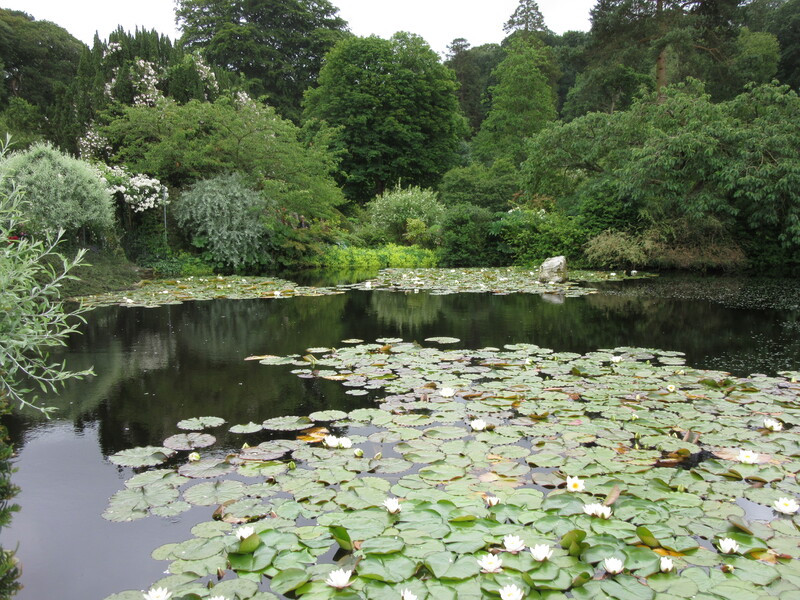 … and leads us around the lake once again. 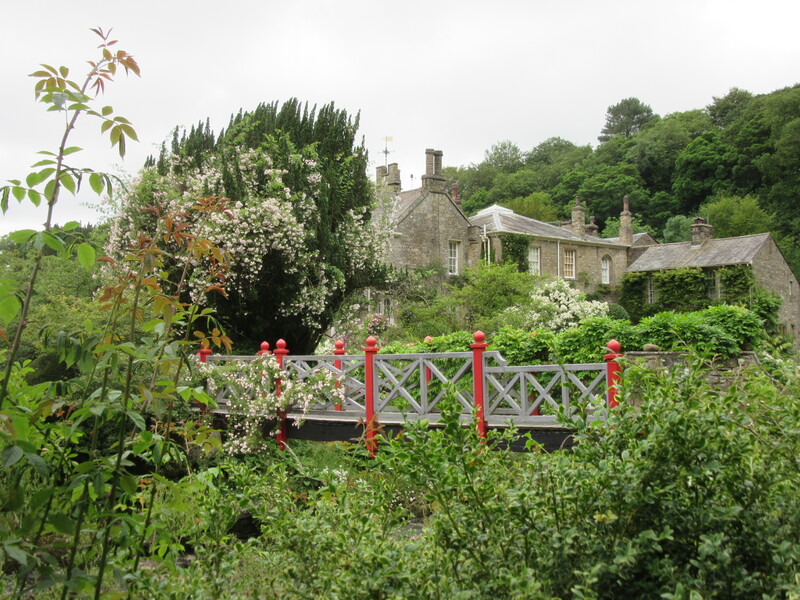 Thank you for this splendid, awe-inspiring journey through the gardens and home of Arabella Lennox Boyd.